zCover TypeOn Keyboard Skin for Apple MacBook 13"
zCover Inc, the leading manufacturer of fashionable silicone protective cases, has announced today the release of the special edition stylish keyboard skin for Apple MacBook 13". 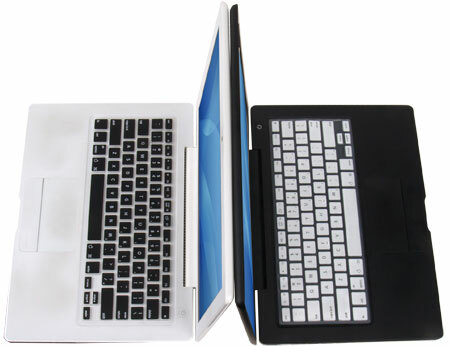 Special design for Apple MacBook 13" Notebook Keyboard, this pre-printed keyboard skin make your Black Apple MacBook 13" and White Apple MacBook 13" in a completely stylish showing. Armed with "show style, enjoy functionality" this special edition stylish keyboard skin highlights your MacBook, and provides quality protection to the keyboard from dust, spills, staples and many other contaminates that could enter through the keyboard and cause harm to the MacBook . Adding ease and convenience the cover is so versatile and robust it can be washable. Precision moulding for each key and a high know-how printing process known to zCover as "zPrinting" gives the cover unquestioned durability. The cover does not slip or slide and fits as such it belongs, moulding itself to every contour of the Mac keyboard. The printing does not peel or fade and the high quality silicone is resistant to ripping or tearing. This new released special edition stylish keyboard skin is compatible with Apple MacBook 13" North America English layout keyboard.